Having a killer approach to social media is essential for an online business; these networks are often the main channels of communication with customers in the absence of brick and mortar stores. We’ve already reviewed how some e-commerce heavyweights have taken on the world of Facebook. But social media strategies are not one size fits all, and companies should take tailor their approaches to other networks accordingly. There are also some great examples of Twitter strategies among online businesses. These brands have done great things for customer service and brand recognition — even within the 140 character constraints of the microblogging platform. eBay is one of the titans of e-commerce and online services, and its Twitter strategy involves operating seven verified accounts. The company has a main channel for people looking to buy or sell, plus feeds focused on specific topics such as bargain hunters, fashion sales, or customer support. Most of the secondary accounts are standard fare for a huge company, but it does have a more unique feed called eBay Ink for the brand’s corporate blog. While most of the suite of feeds are focused on the customers and sales, eBay Ink gives a fascinating perspective on the company beyond just the customer transactions. It retweets insightful articles and analyses of e-commerce and online business, as well as giving a behind-the-scenes look at the massive enterprise behind the eBay brand. The feed is certainly good reading for anyone running an Internet company. It’s a smart move to break out your sales and your corporate branches into separate Twitter feeds if your business is big enough to supply content for two accounts. It means that customers can pick and choose the information they want from you. If they are curious to know more about the business side, they have the option to follow the second feed. Meanwhile, those who simply want to know about what’s up for sale don’t need to scroll through unrelated tweets. 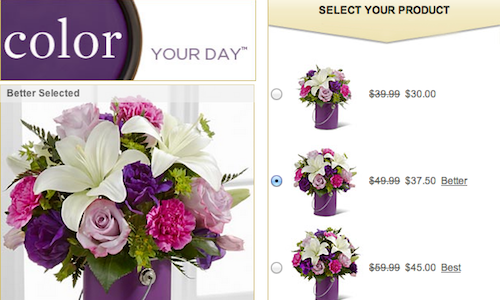 FTD Flowers has a Twitter feed that aims at being a good resource for its customers. This brand has capitalized on every square inch of its Twitter background, including a sidebar with detailed information about how to contact its customer service team and its online community manager. It has more information than you could ever squeeze into a short Twitter bio; keep in mind that in mind if you’re looking to optimize your Twitter background. The flower delivery company has also wisely taken advantage of the Promoted Tweet feature on Twitter. FTD keeps a Twitter-specific deal on same-day flower deliveries at the top of its tweets, which is a great way to both hook in a casual visitor to the feed and to develop loyalty among regular customers. Most of the rest of FTD’s account is focused on highlighting holidays, and on offering deals to followers. There are regular announcements of one-day sales on the network, which is a great way to turn occasional customers into more dedicated fans. Ideeli has a great Twitter strategy focused on engaging its fans and increasing its reach. The discount fashion retailer regularly retweets mentions of the company from customers and window shoppers, which gives some context of how big a reach the company has. It also regularly makes direct mentions of the designers whose pieces are up for sale on a particular day. Other great ways that Ideeli accesses a broader audience is its use of hashtags. For example, it shared photos of New York Fashion Week with the #NYFW tag. The company also uses hashtags for trends, such as #geometric or #boots, so that potential shoppers looking for a good buy online are more likely to find an item they’d want — even if they don’t follow Ideeli. Do you know an e-commerce business that’s a rock star on Twitter? Let us know in the comments!